Cutting-edge marketers, we hear you: we know you’ve been dying to see all your social networks in one place. 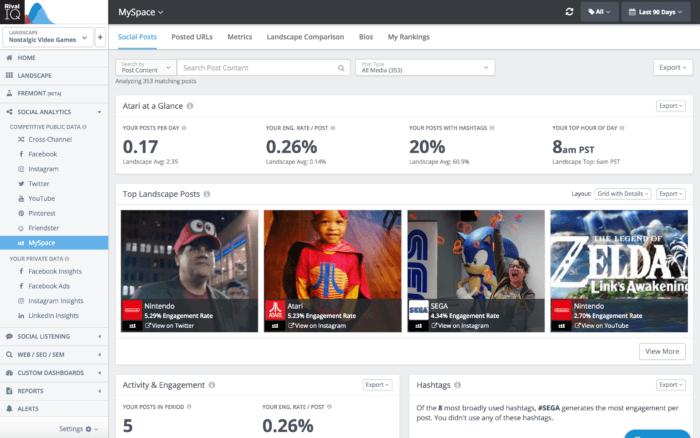 Starting April 1, we’re thrilled to add MySpace and Friendster to the Rival IQ family of social channels and clinch the spot as the most complete social media analytics tool. Gone are the days of having to log into these networks separately to see whether you’ve added any new fans besides Tom on MySpace, or whether your friends have liked your latest post in Friendster. Read on to find out more about how you can start integrating these networks into your social analytics right away. Site hits: Those website visits aren’t going to count themselves (well, unless you have a site visit counter). We make it easier than ever to see how many tens of people are visiting your MySpace page each month so you don’t miss anyone. Top 8 tracking: Receive a custom alert right to your inbox every time a friend moves you in or out of their top 8 to maximize your engagement. 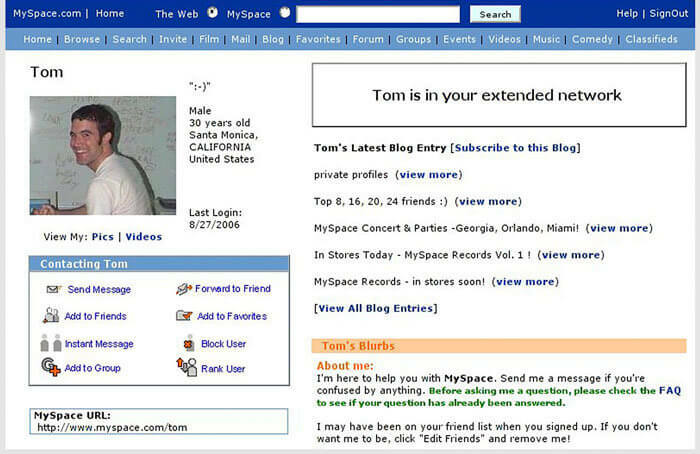 MySpace mood support: Obsessed with setting your mood on MySpace as a warning or invitation to your friends and fans? Our interactive moods custom dashboard will show you the impact of posting five blurbs a day about how excited you are about the new Backstreet Boys album on your friends and followers. Tailor your content to their moods (or don’t–Backstreet boys rule). Sadly, there’s one MySpace analytics feature we simply aren’t able to offer: any MySpace Music stats before 2015. We were all wired up, but weren’t able to map our servers to MySpace’s to pull in stats on your music because of some mayhem on the MySpace side. 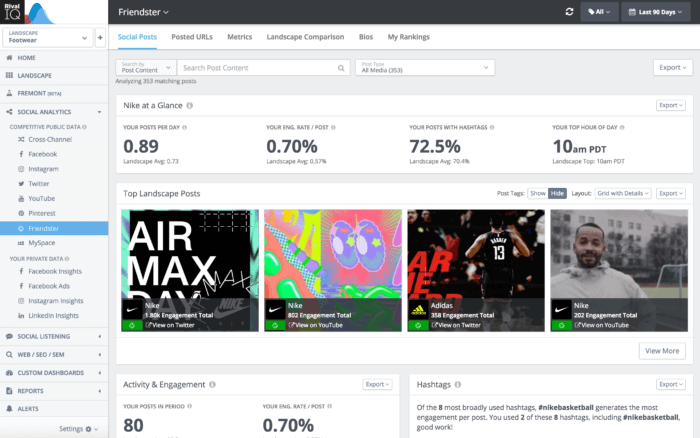 Sure, Friendster users are all about the close personal relationships, but that shouldn’t stop a marketer from trying to get a closer look at all that data, right? Friend, member, and fan counters: On your way to becoming Karen Kong, the Malaysian pop star with the highest number of Friendster supporters? We’ve got you covered with everything you need to skyrocket to popularity on the world’s biggest (er, oldest) social networking site. Site loading speed: We know that slow site performance has led to your Friendster friends jumping ship for faster social media networks like MySpace, so we’ll help you keep an eye on your loading time. Music reviews: Friendster’s name is a mashup of “friend” and “Napster,” so we knew we needed to support tunes here too. Track your music reviews, and even discover new bands to review. Hot tip: we hear Destiny’s Child’s lead singer is going to be huge. We really want to thank all our customers for their patience–we know it was a tough 17-year wait, but we hope it was worth it. Do you have a social network you’d like us to include in Rival IQ? Don’t hesitate to reach out to us on Twitter with your suggestions.